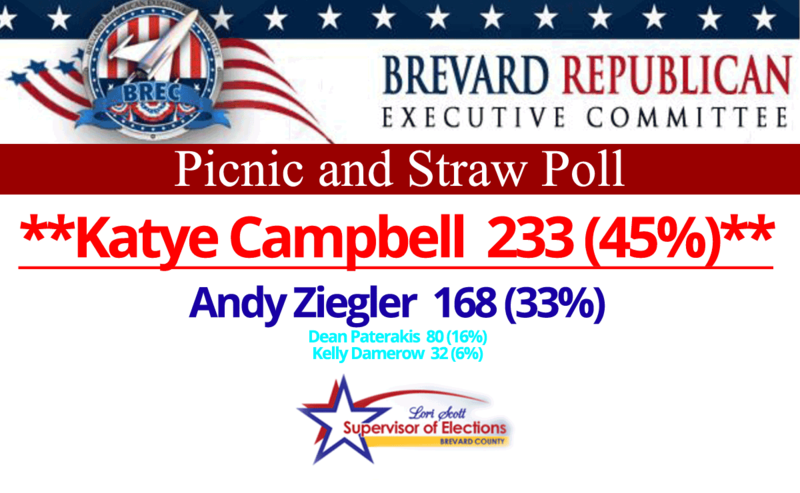 On July 8, at the Brevard Republican Executive Committee, the BREC and Lori Scott, Brevard Supervisor of Elections conducted another straw poll. Katye Campbell was able to address the crowd along with other candidates, and it was evident from the jump that the crowd was with Katye. Cheers and applause was heard throughout the 5 minute speech, and that support carried through the straw poll where Katye comfortably won the day. Capitalizing on the momentum, Katye won the straw poll by over 12% over the closest opponent, the incumbent. This showing further showed that District 5 is ready for a change and Katye Campbell is the candidate on the rise.